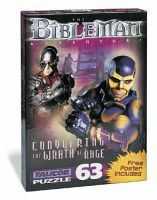 The BibleMan Wrath of Rage Puzzle offers challenging educational fun in the form of an entertaining activity! Children will happily spend hours developing their problem-solving skills as they figure out how to put their BibleMan hero together. So encourage your child to strengthen his or her logic skills while having fun piecing together a beloved character. Ages 4+.